If you’re looking for a festive, healthy, and patriotic dessert to make, look no further. 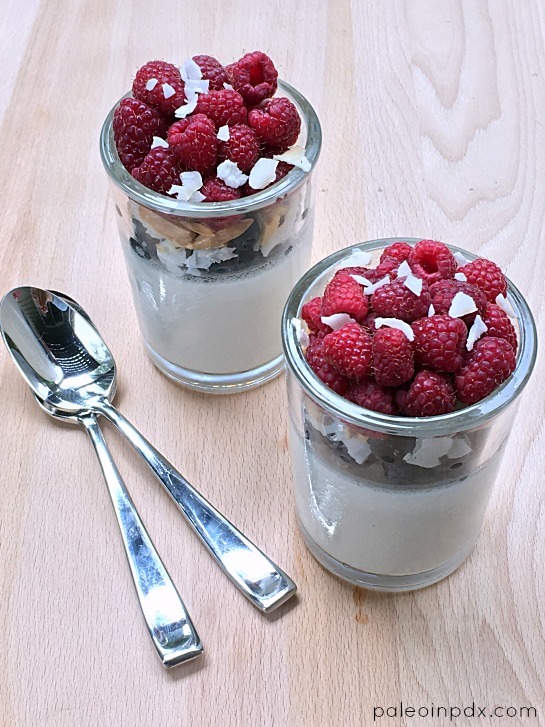 I’ve got you covered with this non-dairy Fourth of July panna cotta featuring coconut milk, blueberries, and raspberries. It has a hint of lemon flavor thanks to the lemon essential oil and tastes wonderful with the fresh berries. If you don’t have access to the lemon essential oil, you can substitute lemon extract instead (1 tsp is probably enough, but it depends how lemony you want it). Strawberries would also be a great addition to this dessert if you want to add some extra red color and more berry flavor. On another note, I went back on KATU Afternoon Live yesterday and made my summer “grain” salad with lemon tahini dressing. Watch the replay of the segment HERE. Pour water into a small bowl and sprinkle in the gelatin powder, allowing it to bloom. Set aside. Pour the coconut milk into a small saucepan and heat on the stove over medium heat. Whisk in the vanilla and honey. Once the honey is fully dissolved, add the gelatin mixture and whisk until dissolved. Remove from heat and whisk in the lemon essential oil. Divide mixture equally among three individual size glasses or small bowls (small mason jars also work well). Place in fridge to set for at least 4 hours. Once set, top with desired amount of fresh blueberries and raspberries. Garnish with the slivered almonds and coconut.